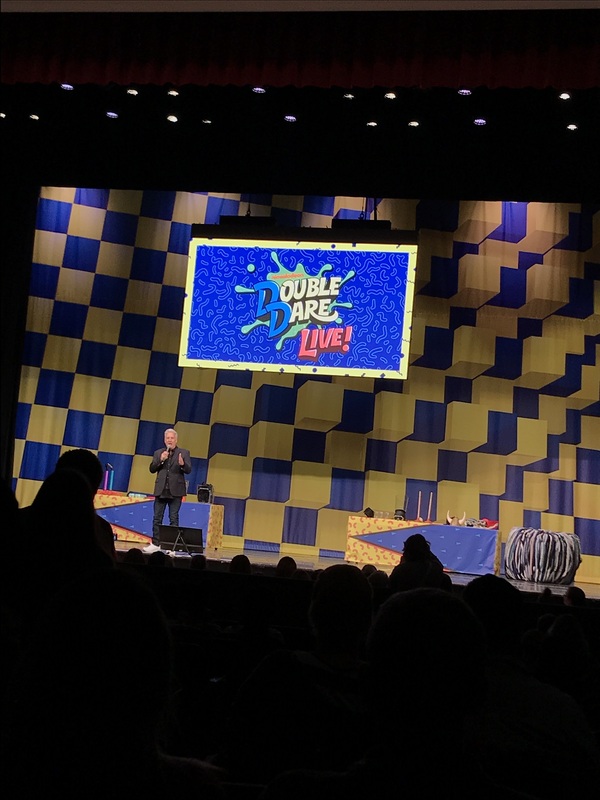 Last Tuesday, Jay, Zach, Alex, and I joined our friends Elena, Chad, and Katie at the Double Dare Live tour. It was so awesome! 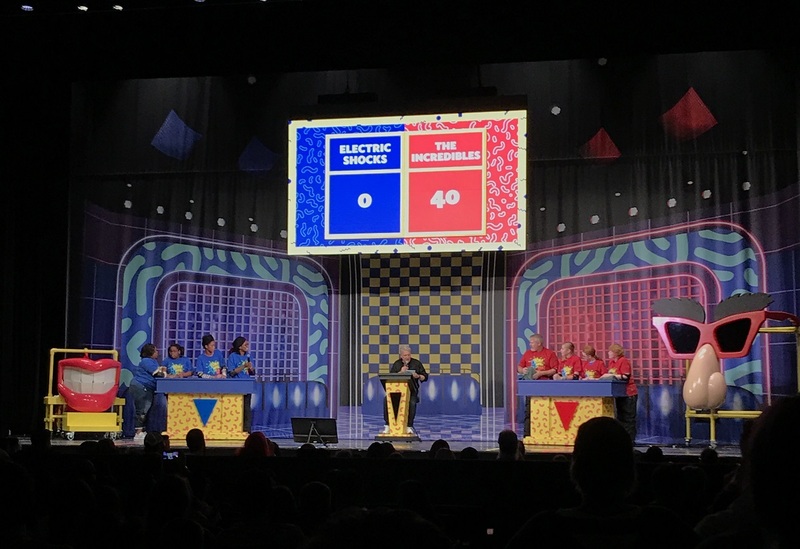 Jay and I watched the new season of Double Dare and the old seasons of Family Double Dare with Zach over the summer, so we jumped at the opportunity to see it when the show toured in our area. Marc freaking Summers was there! And he kept coming into the audience so at one point, he was like 5 feet away from us. It was SO COOL. Here’s how it went down. For the first 45 minutes, they took volunteers from the audience to do the different challenges on stage. Sometimes it was paired up kids against grown-ups, sometimes it was a grown-up and a kid, sometimes it was kids against kids, other times grown-ups against grown-ups. 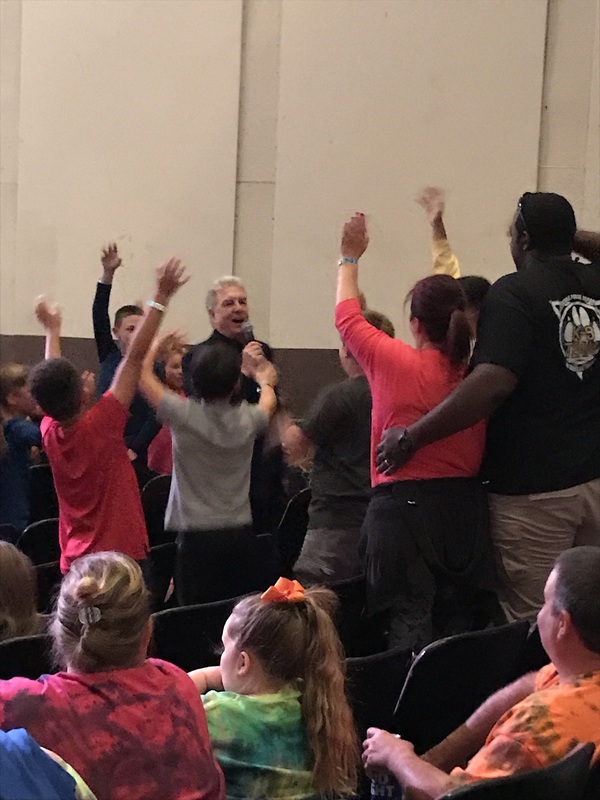 Every single adult there was super enthusiastic and answered their own version of “Hell yeah!” when asked if they had been a fan of the show as a kid. It was like Millennials go to Nickelodeon heaven. Marc getting contestants from the audience. There was a 15-minute intermission after the challenges were done. When the show resumed, they had families compete to widdle it down to a final two that then competed a la the actual game show. That part was especially a blast. They did questions, physical challenges, and the winners got to do the obstacle course! We were so envious of the woman who got to pick the nose to find the flag. Jay and I have watched so much Double Date that we have strategies and plans if we ever get to be on it! I hope this is still around 10 years from now so we can compete with the boys. It really was just a super fun night. 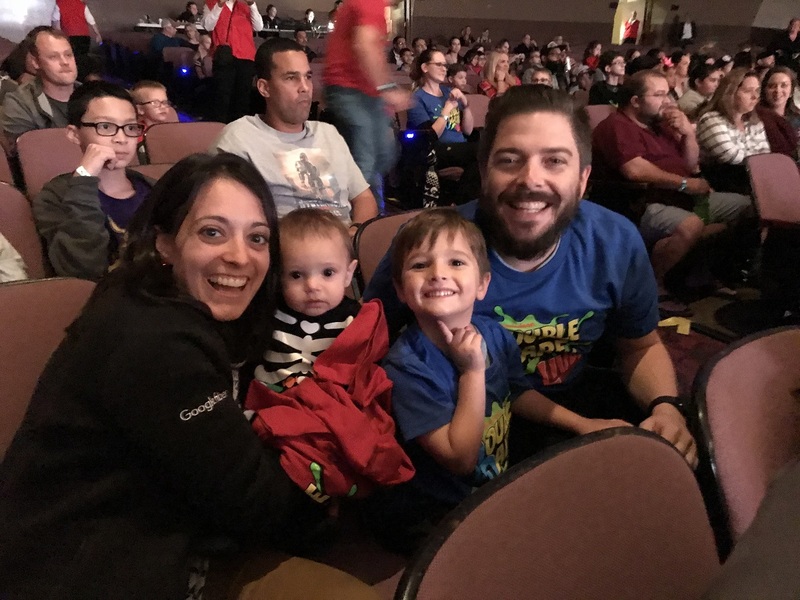 Even Alex, who desperately wanted to go to sleep because he has a pretty strict 7 p.m. bedtime (and the show started at 7 p.m.), was well-behaved because there was enough stimulation around him to keep him interested in between yawns and snuggles. Jay and Zach had a great time, too. They left the obstacle course up after the show was finished and they went up to the edge of the stage and got to touch the nose! 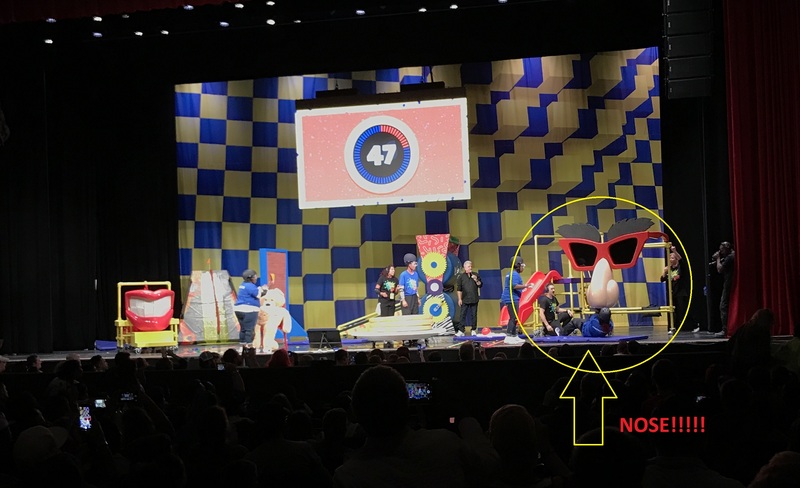 Double Dare live gets a big thumbs up from us. If it ever comes to your area, definitely check it out. The only downside is that it is somewhat pricey ($50/ticket). I would not recommend doing the VIP tickets. Jay has a friend who did that and said that they really weren’t that worth the extra money. Finally, a big shout out to their customer service department. We bought 3 t-shirts and I washed them when I got home. I followed the instructions and did tumble dry low and the logo on Jay’s got a bit melted on the inside. They replaced it for me without any trouble at all, to which I was grateful, as the shirts were also a bit expensive ($25/shirt). Thanks, DD customer service! Daddy & Zachy watching the challenges. Alex snuggling in because it was past his bedtime! Friends at Double Dare Live! This entry was posted in Adventure, Good times, NC Adventures and tagged Double Dare Live, Marc Summers, Nickelodeon. Bookmark the permalink.